The smartphone we all carry every day is arguably the most important invention of all time. It has enabled 2 billion people to gain instant access to artificial intelligence, as well as hundreds of Libraries of Congress worth of information. The processing power of the smartphone dwarfs 1990s-era supercomputers and has turned instant communication through voice, text, photos and video into an everyday banality. What's the next invention that will change the world like the smartphone has? I believe it will be the artificially intelligent light bulb. It should have been possible in 1994 to predict the smartphone. In 1994, the graphical Web existed. There were personal digital assistants, mobile phones and wireless data. We should have known these would converge into the smartphone. In the 1990s, we should have recognized that the IBM Simon represented the future of consumer tech. In fact, there already was a "smartphone" by then. At a Comdex show -- the CES of that era -- IBM demonstrated a prototype device code-named "Angler," then made it commercially available two years later as the IBM Simon. It was the first cellphone with email, a "word processor," an address book, a calculator, maps, stock prices and news. Crucially for it's time, but hilariously for us now looking back, the IBM Simon could send faxes. Amazingly, the Simon didn't have a physical keyboard but an on-screen keyboard, plus a stylus. It also cost pretty much what an iPhone costs today. IBM Simon was purchased by just a small number of early adopters and made little impact. But we should have realized that it was a first glimpse at a device category that would completely change human culture. It was unimportant as a product, but massively important as an idea. For lack of a better term, Moore's Law, or the inevitable improvement in computer-related devices as a function of the cost, makes rare machines ubiquitous and expensive computers cheap. We knew that processing power, screen quality, memory chips and all the rest would become fast enough and cheap enough for mobile use. We should have known enough about human nature to realize that high-quality smartphones would be extremely desirable, and that they'd become cheap enough for most people to own. In hindsight, the smartphone was a technology of perfect inevitability that we should have predicted. The A.I. connected light bulb is the next world-changing device we should be predicting, if you think about it. So let's think about it. Sony last week launched a connected light bulb that contains everything needed for the ever-present A.I. appliance of the future. Sony's Multifunctional Light offers a glimpse of the future of A.I. appliances that live in light bulb sockets. Sony's Multifunctional Light works like other smart lights. Brightness is automated or can be controlled with a smartphone, thanks to the LED lights, built-in Wi-Fi and a dedicated app. That's all pretty standard for a smart bulb. But the Sony bulb also sports a motion-detector, a brightness meter, temperature and humidity sensors, an infrared sensor and a memory card slot. Oh, and it has a built-in speaker and microphone. The sensors are designed for improved automation. For example, you could set the light to turn on by itself, but only at night and when humans are present -- the light sensor and motion detector would be able to tell. Theoretically, however, the presence of speaker, microphone and Wi-Fi connections means it's already capable of serving as a way to communicate with the Amazon Echo's Alexa, Apple's Siri, Google's Google Now, Microsoft's Cortana or any other virtual assistant. Actually enabling access to existing virtual assistants would require minor software and network changes. Sony apparently intends the speaker and microphone to serve as a speakerphone for smartphones and an intercom system for the house. No, the revolution hasn't started yet. Sony's Multifunctional Light ships later this year in Japan only. Even then, it probably won't communicate with a virtual assistant right off the bat. 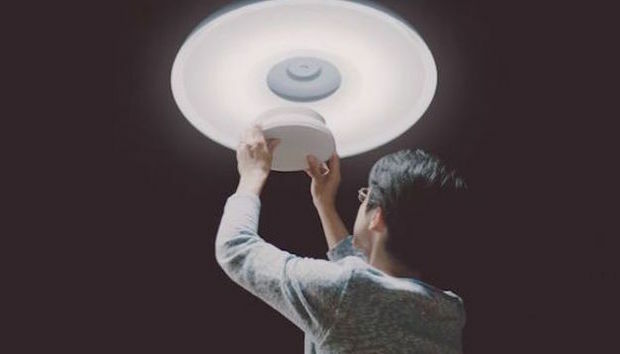 But as with the trend lines, the Multifunctional Light serves as a proof of concept that light bulbs can be fitted with speakers and microphones and connect via the Internet to remote servers, as the Amazon Echo does. I see the Sony Multifunctional Light as the IBM Simon of the coming virtual assistant appliance revolution. It's rudimentary and limited by comparison to what's coming, and it probably won't succeed commercially. What's needed is for more such light bulbs to come on the market, and for these to openly support virtual assistants -- and for Amazon, Apple, Google and Microsoft to support these products as extensions of their own virtual assistant products. Smart devices need electricity and will continue to need it well into the foreseeable future. Homes are already wired for electricity, and this electrical power is delivered to two categories of receptacle: electrical outlets and light bulb sockets. Because light bulbs are located in places where they will shine light on human activity, they tend to be easily accessible, in spots where people live their lives. While the electrical outlet might be behind the couch, the lamp that's plugged into the outlet sits right next to the couch, where you could easily talk to and through it. The same goes for other lamps, built-in ceiling lights, garage lights, bathroom lights -- they're distributed in every room and within speaking and hearing distance. Smart bulbs, which will also have Wi-Fi, need only speakers and microphones to make them extensions of our virtual assistants. By plugging these appliances into light sockets, rather than wall outlets, they become invisible, "wireless" and centrally and conveniently located. There are two kinds of people: Those who own an Amazon Echo and are living in the future, and those who don't have it and therefore don't get it. In 1994, the tiny minority of cellphone owners couldn't imagine life without one, while the majority thought it was a trivial fad. In 2004, the few people who owned smartphones couldn't imagine living without one, while most people believed "dumb" feature phones were perfectly acceptable. Today, of course, most people couldn't imagine life without their smartphones. This pattern is repeated with the Amazon Echo, the only mainstream cloud-based virtual assistant appliance. Any Echo owner, including me, will tell you that it's an indispensable gadget, while nonowners will dismiss it as something unnecessary. The Echo owners are right: Virtual assistant appliances are inevitable, and we'll all want them in every room in the house, in the car and at work. This opinion will grow to become the mainstream opinion. Another small step has been taken toward extending access to virtual assistants in the car. Ford announced at CES that its dashboard platform, Ford Sync Connect, will get Amazon Echo support in both directions. That means you'll be able to start your car with a voice command from the kitchen, and also warm up the oven from the car (and do everything else one can do with an Amazon Echo). Amazon Echo is also extending into the workplace. The Wall Street Journal last week reported that Amazon is working on a smaller and cheaper version of the Echo. It's reasonable to assume that a smaller size means a quieter speaker, which suggests that it's designed to work at closer range -- say, on a desk where you're sitting. The new Echo is also reportedly designed to be unplugged and run on batteries, which means it could be taken on business trips, to picnics and to meetings. Of course, I told you in August about Amazon's secret "Kabinet" project, which appears to be a dedicated Amazon Echo with a screen that's optimized for the kitchen. Amazon is way ahead and pulling away from the competition on the "appliance" model of virtual assistants, as opposed to the inferior Siri "app" model. Apple, Google and the others will jump on this particular bandwagon or be left behind. Once these appliances cover our homes, cars and offices, we'll interact with our virtual assistants via smartwatch or smartphone only as a last resort while out and about. The ubiquitous presence of our favorite virtual assistants -- combined with two or three more years of evolutionary improvements in their abilities to converse with and understand us (and do things for us) -- will transform how we use computers and the Internet: Talking and listening will become by far the dominant interface, eclipsing even the smartphone. That's the revolution: Just as the smartphone started as an adjunct to desktop computing, and grew to be the main way we use computers, so will the virtual assistant appliance grow to take over from smartphones as the preferred method of communicating, getting information and doing things online. And as the capabilities of this A.I. grow, so too will our creativity and our ability to use it -- and our instincts and knowledge about doing things with apps on a smartphone will atrophy. Turning light bulbs into Amazon Echo-like virtual assistant appliances is the brightest idea of the decade, and it's going to change the way we do everything.